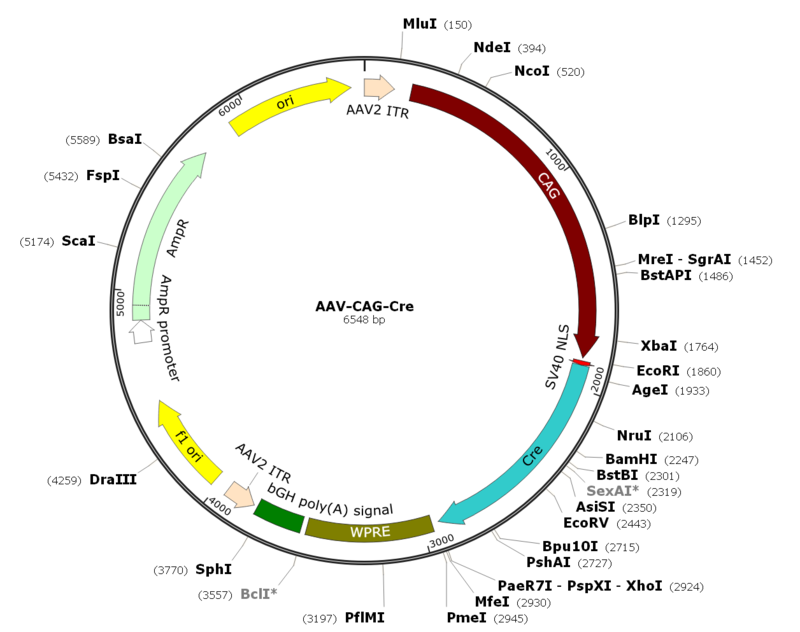 Description: AAV2-CAG-Cre is a pre-packaged rAAV in serotype 2 (with capsid from AAV serotype 2 and 2xITR from AAV serotype 2) which over-expresses Cre recombinase under CAG (also known as CBA) promoter. CAG promoter is a combination of the cytomegalovirus (CMV) early enhancer element and chicken beta-actin promoter for high levels of gene expression in mammalian expression vectors. This pre-made rAAV can be used in the Cre-lox system as a genetic tool to generate site-specific recombination of DNA between loxP sites in cultured cells and animal experiments. Ready to use format.